We have these hard-to-find covers for your 1937-1962 Chevrolet 216, 235 and 261 engines. These Chevy 6 cylinder finned aluminum Offenhauser valve covers will shine up your old Stovebolt. NOTE: To use on 1954-1962 inline six head, you will need to supply a 1937-1953 style gasket, a pair of washers and stud seals typical of 37-53, and a pair of acorn nuts to fit the long studs that come with the cover. This cover is a direct replacement for the 1937-1953 Chevy. This valve cover is a direct fit for 1937-1953 216 and 235 engines. To use on a 1954-1962 head, installer will need to supply a 1937-1953 style gasket, a pair of washers and stud seals typical of 1937-53 make, and a pair of acorn nuts to fit the long/extended studs that are included with the cover. 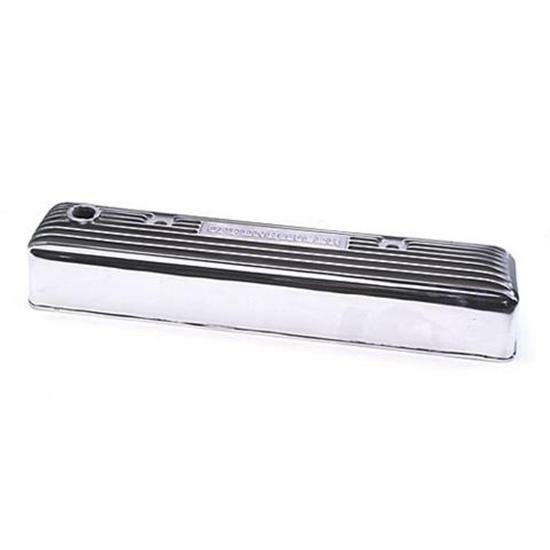 1960-86 SB Chevy Tall Valve Covers, Flame Milled, Polished Alum.